Power Of The Primes first episode premiered today, and Machinima has just shared a Prime Wars Trilogy Recap Video with the events of previous Combiner Wars and Titans Return shows. You can access the video via Prime Wars Tumblr or Machinima’s Facebook. Old-timer fans will be pleased to know that Victor Caroli, the unforgettable narrator of several G1 episodes, is voicing this 5-minute video. 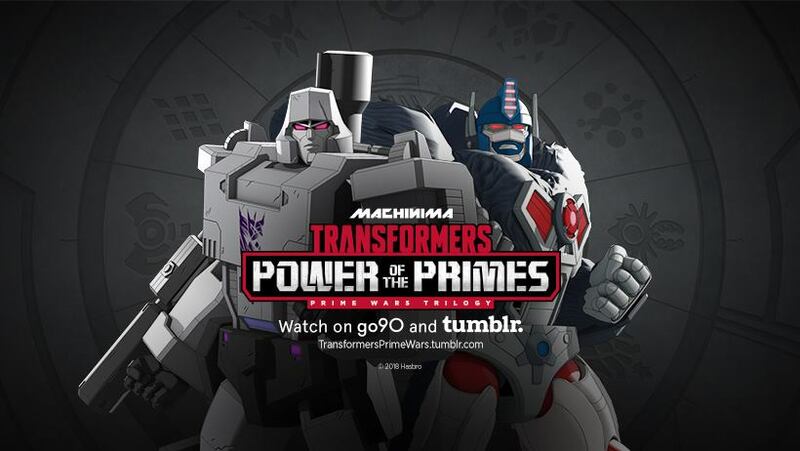 Machinima has also updated their Facebook cover with a Power Of The Primes image featuring Megatron and Optimus Primal. You can check out the video after the jump, and then join to the ongoing discussion at the 2005 Boards! See if they just left it at this I would be happy! remove all the pausing and drivel with some good voice overs and this is what you get haha. 10-15 mins finsihed product would be awesome. He doesn't sound exactly the same, but then it has been over 30 years since the movie. He also sounds like he's reading straight from a script whereas in the 1986 movie and cartoon episodes, everything was slower and more pronounced for dramatic effect. Sure, there are other factors in play, but come on man at least it's cool as hell to hear that voice again. Man, hearing Victor Caroli's voice narrating a Transformers series just gives me goosepumps that takes you back. WOO!!! That was actually a pretty cool promo. So for all the things they managed to get Victor Caroli for, it had to be this garbage? Ugh. Use the guy in something actually worth a damn. I'm pretty sure all they think is that it gets views so it makes money and therefore, that is good. I doubt they care about the quality. I know people will say "BUT THEN WHY DID THEY GET BETTER VOICE ACTORS, HMMMM?" but the answer to that is simple: it's to make the fans happy. I'm sure Hasbro knows that most people don't seem to like these shows, but by adding some big-name voice actors, they appease some of the fans (enough to get people still watching, at least) and quell some of the discontent. They've done it again with POTP to further appease fans. All it takes is a little fan service and people who are complaining will keep watching. Plus, think of it this way: they could put their resources into making a full-on cartoon with all these good voice actors and better animation and proper plots and all of that, and end up making a really good show… or they could continue pumping out this crap but just shell out a fraction of the budget they'd need for a good show to hire some old voice actors to appease the fans. The latter is cheaper and ultimately works just as effectively as making a good show on a higher budget. My guess is that's part of the reason Cyberverse will have 11-minute episodes instead of full-length episodes – because at the end of the day, it's cheaper to do it that way and it should theoretically have a minimal impact on the perceived quality (i.e. how many people view it and how much money it generates for Hasbro). Yep, someone needs to ask at a convention or something though. I really want to know if machinima and hasbro think this show is good. Or if they don’t and evil corporate assholes. I genuinely hope it’s the latter, becuase if they think this is good and then they’re bloody mad. I love beast wars, for me beast wars and g1 is all the same continuity, so I love it. With that said, I keep on saying to myself, man If star saber had won was in this in the role of primal, wow that would have been preferred . What a wasted opportunity . Yeah, but on the other hand, his first exposure to many fans isn't this dreck. Poor Primal. Still salty about Primal winning, but at least Star Saber doesn't have to be subjected this abomination. I still can't believe they got Victor Caroli back for this . Hearing Caroli again is a welcomed surprise. Hearing Caroli say (toward the end), "in search of yet another ancient artifact" is everything that's been wrong with Transformers motion picture media for a long time. Find the McGuffin, beat the bad guy, find a new McGuffin to beat another bad guy, and on and on. Is that really all they think of their own characters? Their own world? That's the best story they can come up with? It's not a Transformers cartoon if it doesn't devolve into a fetch quest . Always a breath of fresh air to hear Victor Carolli doing his narrations that never gets old. Thought that first episode was surprisingly solid considering the usual standard of the series. 3. Me Grimlock King ! That's because they're not their BW sizes. They're new iterations of themselves in PotP, so they're the average Cybertronian size. Good choice IMO. Oh, Power of the Primes Episode 1 is out. I didn't know that. Nice. That was more entertaining than the two series\' combined. Hearing Victor Caroli\'s voice narrating Transformers takes me back! While the show is admittedly a mixed bag, the decision to bring in classic, beloved voice talent like Victor, Berger, Cullen, and Judd Nelson ties the cartoon to the rich G1 backdrop and makes the series resonate with loyal fans. I cannot say thanks enough for this decision!! New additions are impressive as well, with some big names (Mark Hamill, Ron Perlman, Wil Wheaton) and solid talent on board… including, Frank Todaro, who is an all around great guy and hella talented voice actor. Always glad to see him on the roster. And while you can tell Machinma wrestles with a limited animation budget and various challenges, I can tell they have been listening to fans critiques of the past series. This episode is arguably the best to date. Many of the problems I\'ve had with past episodes (including the \"Sean Connery\" voice slapped on Megatron) are gone. I\'m actually a bit optimistic for the rest of this series. Either way, a hearty \"Welcome Back!\" to old friends and familiar faces… er…. voices! Looking forward to the next episode.